My name is Ulf Kintzel. I come from East Germany. There I did an apprenticeship to become a professional government-registered shepherd. After my apprenticeship I worked on a sheep farm until 1989. After the wall came down I moved in 1990 to West Germany. There I worked on several sheep farms. I tended flocks with 1,000 sheep on average for 11 years under the Transhumance farming system in places like the Black Forest. I then went to college and studied agriculture. I graduated with an agricultural engineering degree. 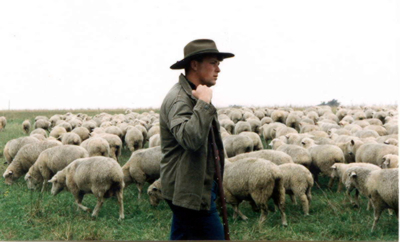 Since 1987 I have competed in many regional and national herding competitions. I finished several times with an "Excellent" (V) rating at the S.V. 's national HGH herding competition, including a 4th place finish just two points behind the winner, and earned the additional honor of being selected best dog handler at another national competition. In 1995 I moved to the US. Until 2006 I lived in Sussex County, New Jersey, establishing and managing White Clover Sheep Farm with the help and support of my late friend Beth Johnson. I started teaching the German tending style, mainly with German Shepherd Dogs. We've held an annual HGH herding competitions since 1997. In 2000, we founded the First HGH Herding Club, a member club of USCA (United Schutzhund Clubs Of America) which became the hosting club for these events. I breed German Shepherd Dogs under the kennel name "vom Quasliner Moor"
In 2006 we moved farm and family to the beautiful Finger Lakes region where we purchased a farm. Currently, I farm about 100 acres of pasture and raise about 200 White Dorper ewes and a dozen Kiko goats. I raise these White Dorper sheep for breeding and grass-fed freezer lambs. I also still train tending dogs and teach people the German herding style. I am married to Barbara, a native of Poland. We have three children: Sarah, Johann, and Lech.